Too many organizations today suffer from silo-centric behavior and intra-organizational conflict. Yet most don't understand what's holding them back from achieving outstanding performance. In this detailed guide, business performance improvement experts Karen Martin and Mike Osterling present a practical way to deeply understand how work gets done--in any environment--and how to design improved work systems. Whether you are a novice, an experienced improvement practitioner, or a leader, Value Stream Mapping will help you design and operate your business more effectively. 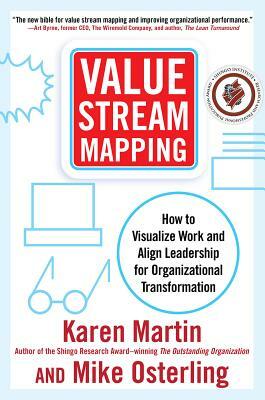 And if your organization already uses value stream mapping, this book will help you improve your transformation efforts. In today's rapid-fire business environment, there are too many problems to be solved and too many opportunities to be leveraged to operate without a highly effective means for accomplishing the important work to be done. Value stream mapping is the missing link in business management and, properly executed, has the power to address many business woes. Karen Martin is president of The Karen Martin Group, Inc., a firm that specializes in business performance improvement and Lean management practices. She's also the author of the Shingo Research Award-winning The Outstanding Organization, an instructor in the University of California, San Diego's Lean Enterprise program, and an industry advisor to the University of San Diego's Industrial and Systems Engineering program. Mike Osterling provides support and leadership to organizations on their Lean transformation journey. Prior to consulting, Mike played a key internal role in Schneider Electric's Lean transformation during the 1990s. He is the cofounder of San Diego State University's Lean Enterprise program and continues to teach at SDSU and other universities.